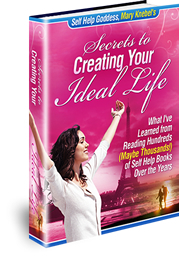 "Secrets to Creating Your Ideal Life" Ebook is Here! Sign up in the pink box to the right of this page or any other page on the site. Simply enter your first name and email address in the boxes, and then hit subscribe. You can be absolutely assured that your email address will only be used to send you this bi-monthly newsletter, and nothing else. Previous issues of the newsletter will also be listed here in case you miss any issues. I promise to use it only to send you Self Help Goddess Goodies.